In a Facebook exchange with Nepali friends back in March 2015, I shared one of the things my students had taught me. As a teacher, if you want your students to really challenge themselves and realize their potential (what teacher doesn’t want that?!) and maybe even go beyond, then one has to have high expectations of them. I explain that away by saying that children are always looking to impress adults in their lives, especially those they look up to. 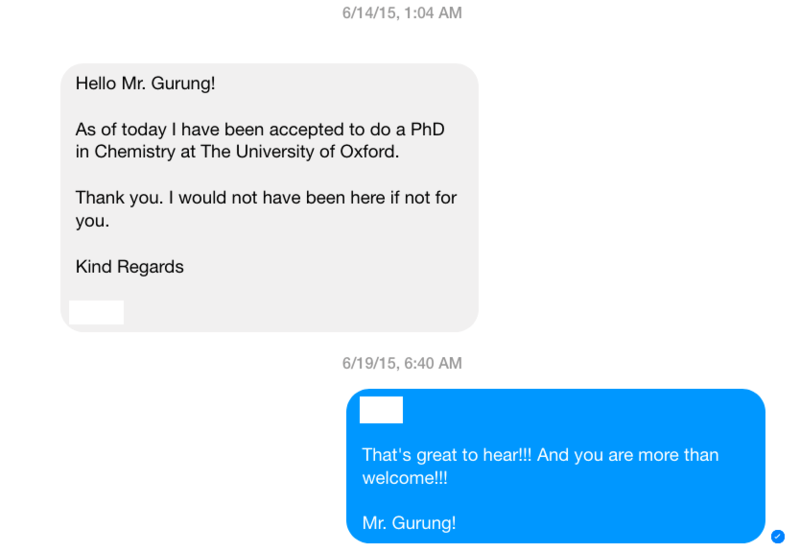 Three months later, I received a message from a former student of mine saying that he had been accepted to a PhD program in Chemistry at Oxford University and how he “would not have been here if not for you”! 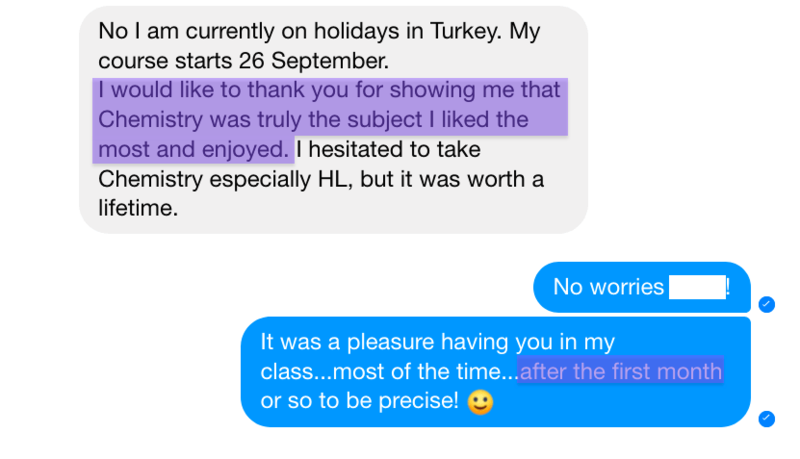 Of course, to a teacher, such a sincere message from a former student is incredibly heartwarming and affirmative! As for the role of high expectation in all this, it has everything to do with my accepting him to the HL Chemistry class and his success in the subject. 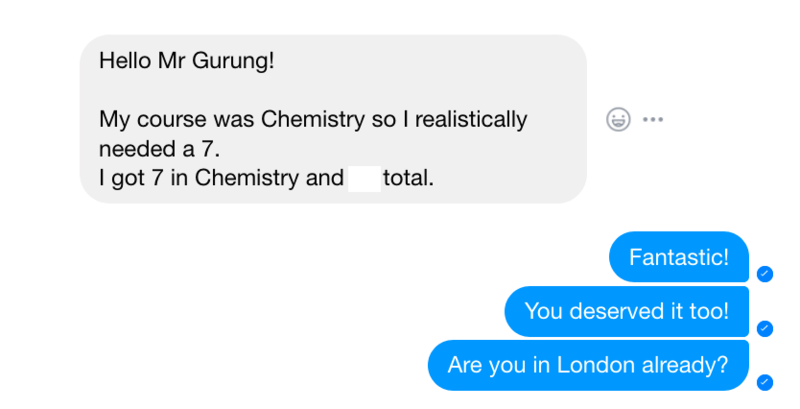 But before we get into that, we’ll first go back to 2011 when he told me that he “needed a 7” and had gotten a 7 (out of 7) in HL IB Chemistry examination! I presume, having applied to Universities in the UK to study Chemistry, he had conditional offers. I am pretty certain one condition would have been a 7 in Chemistry! (By that time, after teaching only the first year of the two-year course, I on the other hand, having already moved on from Azerbaijan, was in Doha, Qatar following a year-long stint in Vietnam! In the exchanges reproduced below, I allude to the fact that I didn’t enjoy having him in my HL chemistry class in the beginning. Of course, I had known that he hadn’t either, which he conceded. 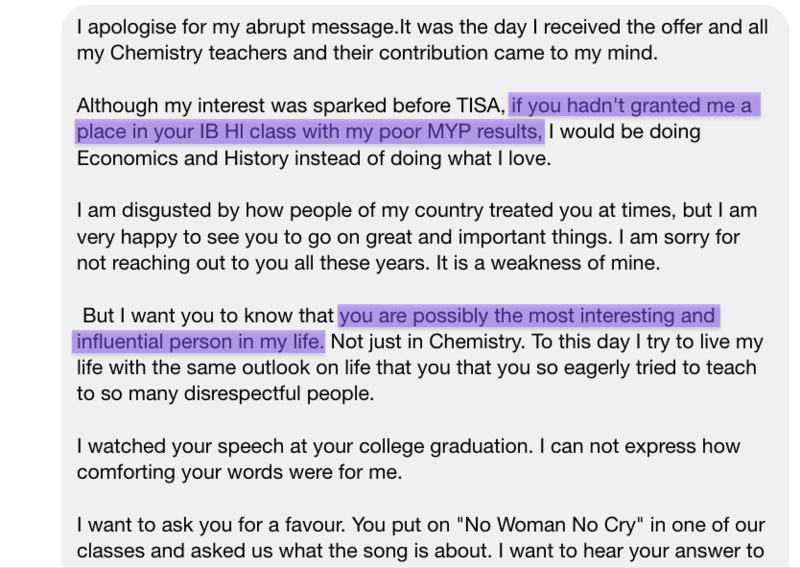 So what did his poor performance in MYP science (which I had taught him for two years (grades 9 and 10)), my “granting him” a place in my HL Chemstry class, our struggle the first month or so in the class, his move to the UK for his undergraduate studies in Chemistry, and to — in 2015 — him deciding to devote his entire life pretty much to the subject have to do with expectations? As an MYP science student, he used to have a laissez-faire attitude towards the subject and performed very poorly throughout the two years. When registration for 11th grade subjects came around, he had discovered that he didn’t meet the criteria to register for HL Chemistry. His performance in MYP science had been too poor. He came pleading to me to make an exception saying that he would change. And I did…but on one condition: there would be a probationary period of three months. I am of the belief that most children of that age, when it comes to school work they can accomplish a lot…if they set their mind to it. The challenge is getting them to! Of course, if the education system and the school culture is NOT conducive to teaching or learning hardly anything substantive of note (which is the case with Nepali education system and many educational institutions in the country), most children are unable to accomplish or demonstrate much, forget about learning and accomplishing anything of note. He had been one of those students who I had believed could do better in the sciences, like even in HL Chemistry…if he put his mind to it. I shared that with him and he agreed. Those were my conditions, those were my expectation, really high expectations! If during the three months, I found him lacking in any way, the agreement was that I would kick him out of my class. And, yes, in IB World schools, a teacher can do that! Naturally, of course, at the start of the year, he struggled to settle into the rigor and demands of HL Chemistry class. That was the month or so we both found each others’ presence in the classroom “not pleasurable,” as it were. 😀 😀 But I just didn’t let him off the hook!! As expected, at some point, before the probationary period was over, something clicked and little by little he started turning around, and he didn’t stop. At the end of that term he achieved a 6, a 7 in term 2, and a 6 in term 3. And as you already know, he scored a 7 in chemistry the final IB examinations which he took at the end of the following academic year. Quite a remarkable accomplishment given his poor MYP science achievements. But then again, not really! He had always had it in him to do well in the subject; he just needed a little bit of a nudge! 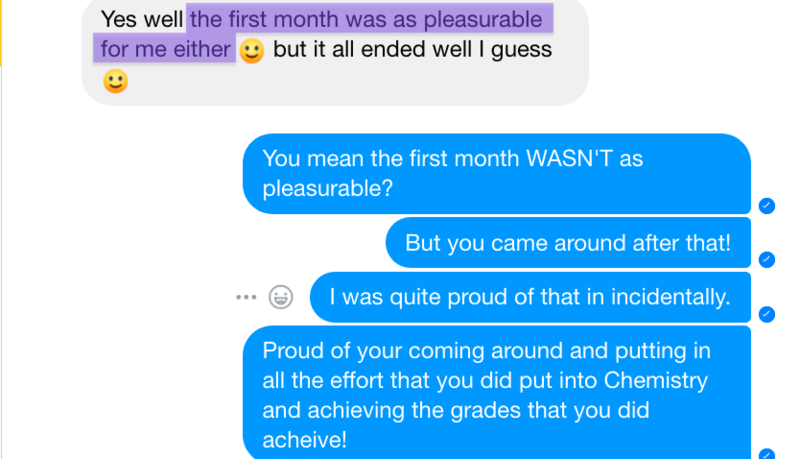 Apart from these messages, there was also something he shared with me towards the end of that academic year. I don’t remember if it was in a face-to-face conversation or in an email but he told me about the days he woke up feeling sick and didn’t feel like coming to school. Whether he did depended on, however, if he had chemistry that day. He just didn’t want to miss a single chemistry lesson! That attitude of my chemistry students towards the subject was also indirectly confirmed by a math colleague. She once shared an anecdote with me which went something along this line. That same year but in a different class I had a HL Chemistry student for whom, firstly, it was her 4th HL class and, secondly, it was not related in any way to the major she wanted to pursue at college and therefore not even necessary for her to be studying the subject at all, forget at that level. She could have breezed through her IB Diploma course dropping her HL Chemistry to Standard Level Chemistry. She stuck with it for both the years and took the examination though! The reason? She didn’t want to miss out on the fun! Many of my students at the time characterized me as a strict teacher, a tough teacher, and one of the ways I was tough on them was by having high expectations, by not allowing them be satisfied with doing the least they could get away with, by not “letting them off the hook”! I don’t think this student would have gotten to where he has, had I not had those very high expectations of him! To be honest though, it didn’t work with every child, but then what does?! Of course, I didn’t refrain from having fun with them either.